Keith Rylatt’s Hitsville! The Birth of Tamla Motown is the debut title from our new publishing arm. This fascinating story of the Tamla Motown Appreciation Society’s pivotal role in establishing the Motown Sound in Britain is lavishly illustrated over 192 pages with unique photos and rare memorabilia. 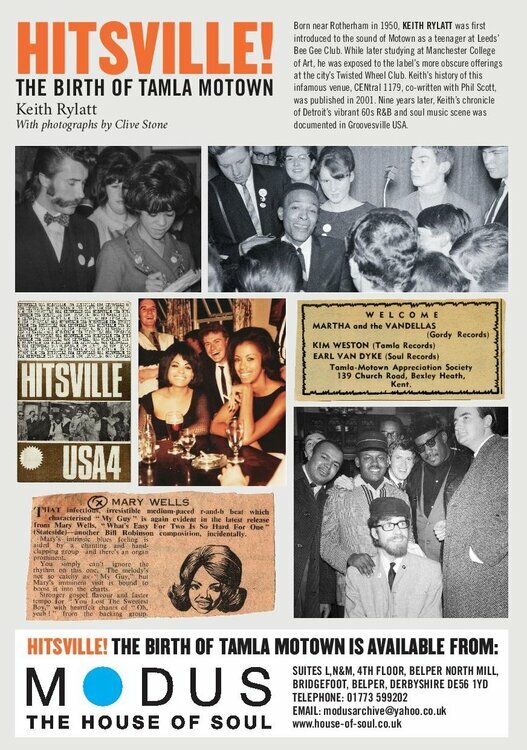 A carrier bag of photos and mementoes from the early 60s was the starting point for this in-depth history of the birth of Tamla Motown. Hidden away for nearly fifty years, they belonged to Clive Stone, who with fellow R&B fan Dave Godin, set out to bring the Sound of Motown to the attention of Britain’s teenagers. Encouraged by Motown’s Berry Gordy, Dave ran the influential Tamla Motown Appreciation Society from his suburban Kent bedroom, organising informal meet-and-greets with the stars for members, and keeping them up-to-date on Motown news. Keith Rylatt chronicles the story from Stevie Wonder’s fleeting visit in 1963 through to the Four Tops’ sell-out show at London’s Saville Theatre three years later – credited as being the point when the Motown Sound finally entered Britain’s pop mainstream. Beautifully presented in full colour, the book includes previously unpublished photographs taken by Clive Stone and other TMAS members, rare memorabilia and many pages from the society’s highly collectable magazine Hitsville USA. Another one to add to the Christmas list! Got my order in for some reading over Christmas. Aim to get my copy soon. Also intend to attend the Tamla Motown Appreciation Society exhibition at the Horse Hospital, Collonade, Bloomsbury. It commences on Sat 3rd Dec so for me will be a good precursor to the 100 Club niter. Took a short drive today to Bexleyheath and knocked on the door of 139 Church Rd. I was curious as to wether the occupants were aware of the history of their home, with Dave Godin holding meetings of the TMAS there. No reply, but next door were astounded at the brief history lesson I supplied and assured me that the current occupants would be well chuffed. A copy of the book shortly headed for their coffee table I reckon.